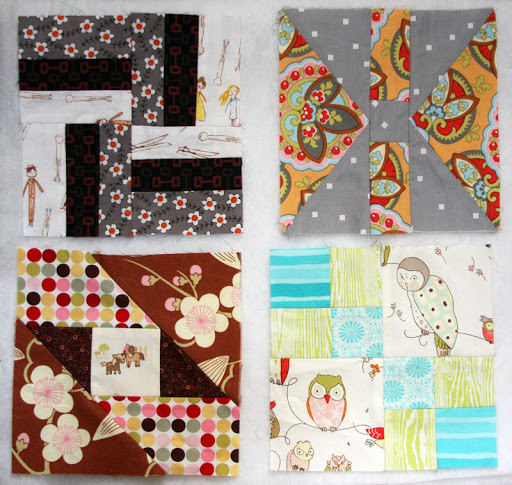 I skipped Block 3 for the time being, due to indecision about what fabric to use. I’m sure my intention to flip it from an on-point block to a straight on one isn’t helping either. I plan to get to it shortly. Instead, I got started on Block 4. For this block, I did the math and skipped the templates. I used a little Flea Market Fancy, and some Heather Ross for Spoonflower. I think the clothespin people are darling. This block caused me some trouble. Apparently I couldn’t figure out how to piece the side triangle blocks and kept insisting on trying to make them taller. 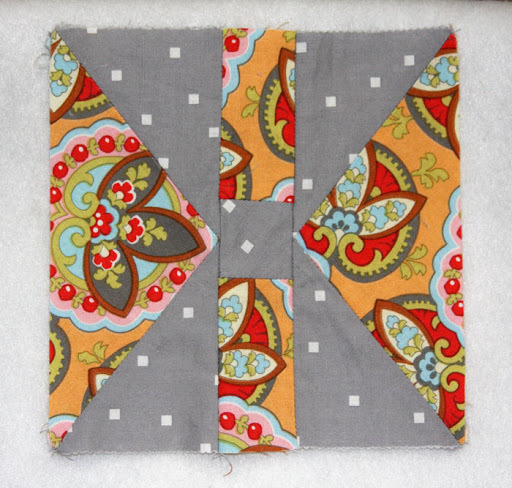 Once I found some forum posts about this block online and noticed something that was different from my piecing, I accidentally stumbled upon my solution. I just couldn’t see it, otherwise. Once I had the correct side of the triangles on the center one, it was easy peasy. I used some Amy Butler fabric and the dot is from Sherbert Pips. So far, this is looking pretty scrappy, but I’m trying to go with it. 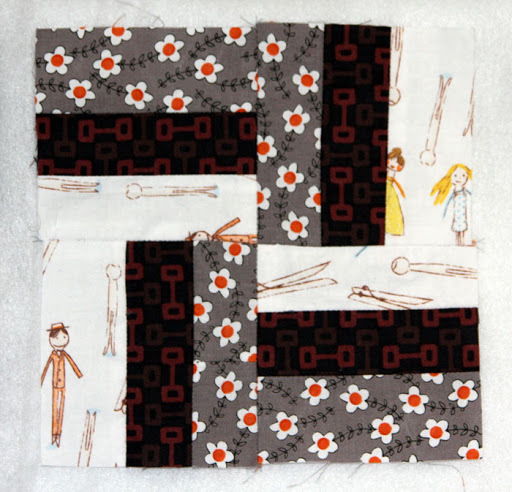 Each block definitely looks like it belongs to a different quilt than what I’m working on. I find it really interesting that as a knitter I do not collect single skeins and have issues using them up because I can’t find a project. As a quilter, however, I purchase a lot of random stuff and it can be difficult to pull them all together. I’m sure by the time I get to 50/100/whatever blocks, it will have a more cohesive look to it due to color repetitions.